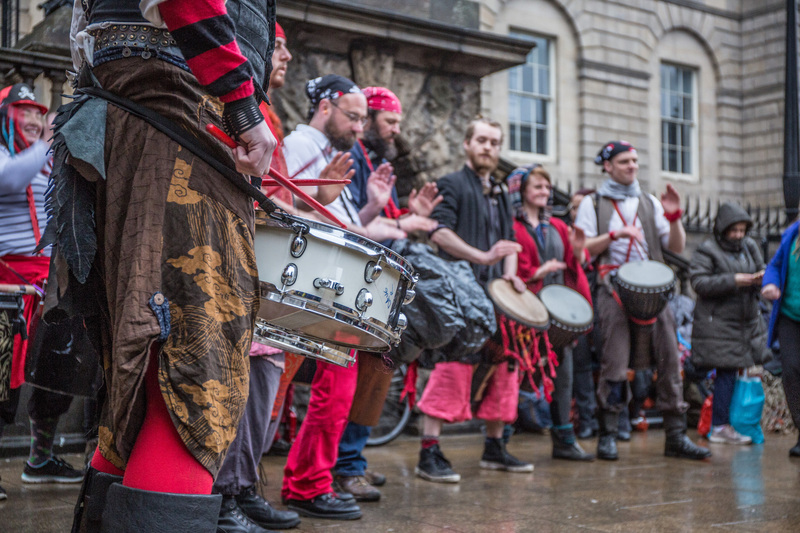 At Beltane Fire Festival, we’re known for drumming up a storm in celebration of Summer’s return. This year we’re adding our voices to the fray, mustering ourselves as an instrument to create melody, bass, and a connection with our past. 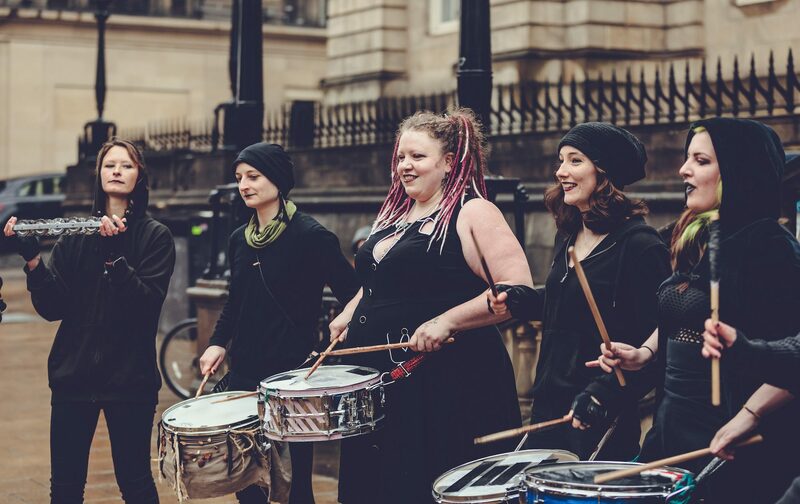 Meet the different groups experimenting with song at this year’s festival, and be sure to join in with them on the night. On their journey around the Hill, the May Queen and the Green Man must pass through the Fire Arch, where the May Queen chooses to turn to journey through the Underworld and initiate change. Waiting at that pivotal point are the Voice of the Hill, a group of elders from another realm. They are gathering and chanting, quietly at first. They chant for fire. Once the Neid fire has been lit they grow in strength, their chanting getting louder and louder. Summer’s spark travels around the Hill and when it reaches them they raise their voices, their energy growing into vibrant fire displays and rippling through their onlookers in a series of calls and echoes. At Beltanes of old, cattle was central to the rejuvenation of Summer. Not only were they a big source of food, but they were also a symbol of wealth for the Gaels. The sacred Neid fire is a cleansing fire, and so ancient communities would drive their livestock in-between two bonfires to rid them of any diseases and ensure future health and prosperity. We might not have any real cows at Beltane Fire Festival, but Guth nam Bò (Voice of the Cattle) will embody the spirit of the cattle who are so important to Gaelic tradition. 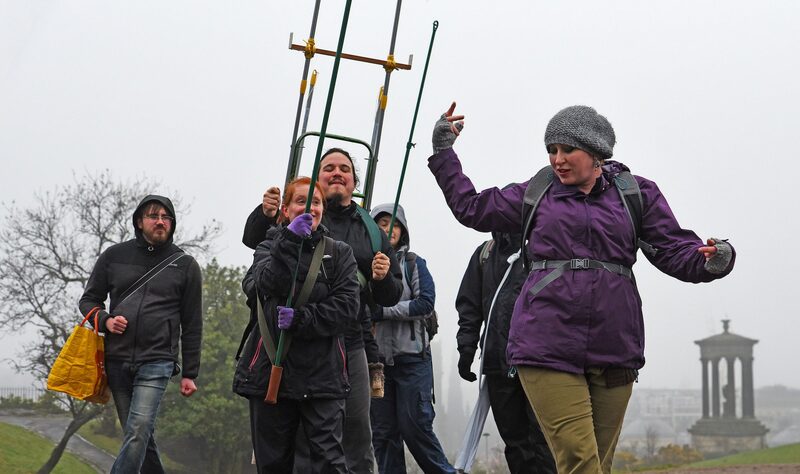 As cows they will sing traditional Gaelic songs, representing our own community’s health, creativity, and togetherness as they roam around the Hill and cleanse themselves in the smoke of fires. 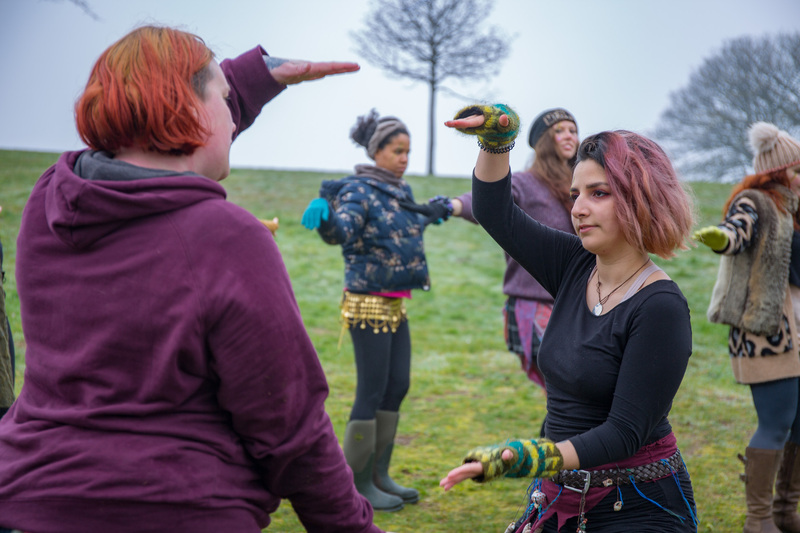 Lots of our groups at this year’s Beltane are exploring the significance of joy, a core part of our revelries on the Hill as we wave off the darkness of Winter. The Fairfaw will embody that feeling, which they uphold with a youthful vigour that embraces Summer’s newness. They show ecstatic abandon and play, inviting the audience to leave their inhibitions and join in with their song and dance. They are a moving carnival, freely roaming the Hill and filling empty spaces with colour, play, dance, and music. They will spread joy through improvised song, body percussion, and ritual movement. Featured image by Duncan Reddish for Beltane Fire Society.